When the SpaceX Falcon 9 rocket headed into orbit before dawn today, it quietly carried some celebrities with it. Or at least their ashes. 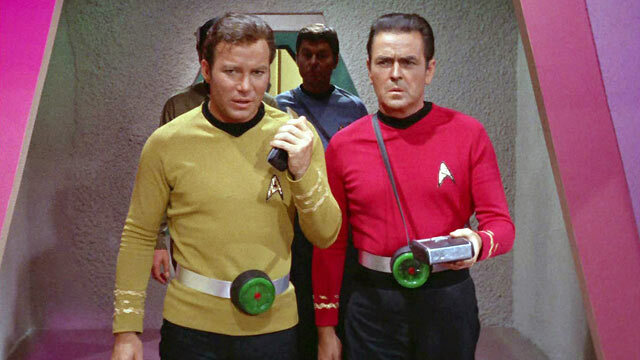 Remember the actor James Doohan, who played Scotty on the original "Star Trek" series? He died in 2005, and some of his ashes were in a container in the rocket's second stage. Also along were cremated remains of Mercury astronaut Gordon Cooper and 306 other people. If you have the money, Celestis, a space services company, will send your loved one's ashes up to orbit Earth. Sound familiar? This is the second time around for Celestis and Space X; the companies tried to launch Doohan and Cooper and 206 others back in August 2008. When the rocket failed to get to orbit, neither did the cremated remains, or, for that matter, some small satellites sent by NASA and the Department of Defense. The satellites were lost, but Celestis has a performance guarantee, which means it holds some ashes back just in case something goes horribly, terribly wrong. It often does in the rocket business. Hence, a second chance. The Falcon 9 lifted off from Cape Canaveral this morning at 3:44 a.m. EDT. What Trekkie doesn't know James "Scotty" Doohan? He was the engineer who beamed Capt. Kirk and Mr. Spock back to the starship Enterprise from the most remote of planets. If only it were that easy to get his remains into Earth orbit. Fifty years ago Gordon Cooper piloted the Faith 7 spacecraft on a 22-orbit mission, the last flight of Project Mercury in May 1963. He later served as command pilot of Gemini 5 in 1965, racking up 225 hours in space. His ashes were carried today by a rocket remarkably similar to the ones that first took him into the heavens. The memorials written by the families of the others on this flight are poignant. Brady Watson Kane died last year in a skydiving accident in Colorado. His family remembers when he told a teacher, "Some day I will take my family to space!" His parents said they will watch the launch on Saturday at Cape Canaveral in Florida. Friends of Francis Edward McShane of New York pooled their money to send his ashes on this flight. Their tribute to their buddy rights the wrongs in his life. He died of a heart attack in the parking lot of the hospital where he worked. "In the balance of life, Frank's scales are uneven," they wrote. "To help right this injustice we now pool our resources to lift his last remains of a noble man to the heavens." Vicki Julian promised her husband, Steve, she would send his ashes to space. Steve Julian died of cancer in 2006. She says his passion to become an astronaut started when Sputnik launched; instead, he majored in history, got married, had two children, and worked in the insurance industry. She is fulfilling his dream of spaceflight. Celestis' prices vary. A suborbital flight with a return to Earth starts at $1,000, the launch into Earth orbit is $3,000, and a trip to the Moon costs almost $10,000. If you really want to go where no man has gone before, a flight into deep space will run you almost $13,000. This puts NASA in a delicate position. NASA's Alan Lindenmoyer, who oversees the agency's relationship with SpaceX, says the cremated cargo had to pass all of NASA's safety requirements. "We had to make sure it would be interfere in any way with our mission objectives before we allowed it go into the rocket," he said. SpaceX is a private company under contract to NASA to take cargo to the orbiting outpost, and this morning's launch is a test to prove to NASA that the company can fulfill its performance promises. The space agency has spent just under $300 million to fund SpaceX under COTS, the Commercial Orbital Transportation System. SpaceX picked up the early development costs for its Falcon rocket and Dragon capsule, hoping eventually to score a $1.6 billion dollar contract for regular cargo runs to the space station. One day, it says, it hopes to carry astronauts. But SpaceX is in business to make money, and if they can pick up cargo on the side, it makes sense financially. The ashes of 308 souls add up to about $1 million -- though 208 of them are make-goods from the previous failed mission. So in addition to the 1,014 pounds of food and supplies headed to the six astronauts on the space station, there are the spirits of 308 people. +SpaceX: Next Frontier After NASA?